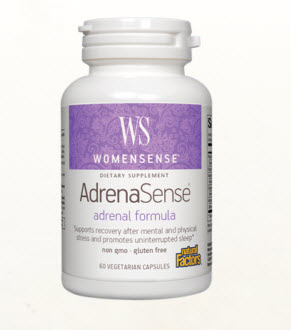 AdrenaSense®, 60 vegetarian capsules (Natural Factors) - Penn Herb Co. Ltd.
WomenSense® is a line of products dedicated to helping women reach their full health potential. AdrenaSense® provides herbal support for healthy adrenal gland function and promotes uninterrupted sleep during occasional sleeplessness. Provides herbal support for healthy adrenal gland function and promotes uninterrupted sleep during occasional sleeplessness. 2 capsules 1-2 times per day or as directed by a health professional. Caution: As with any supplement, consult your health professional before use if you are pregnant, breastfeeding, or trying to conceive, or if you are taking medication, have a medical condition, or anticipate a surgery. Keep out of children.